We decided this year to do the family photos at our place. We hauled the settee out to the back yard and let the doggies play for awhile. It had been raining like cats and dogs. Part the acre was swamp land, but that didn’t slow the grand doggers down. They played and chased and had a grand time. This entry was posted in Autzen, Goldee, Jericho, Odin. I love to see dogs getting on together. 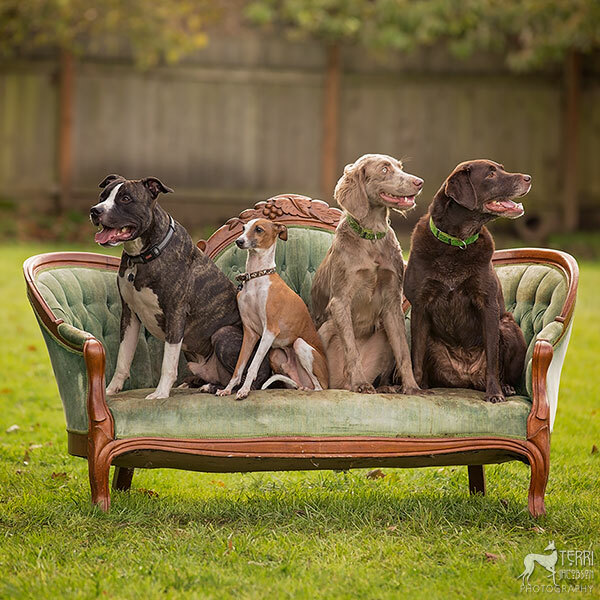 All of the photo models on the settee look so regal and tame, and the settee looks so prim and proper with not a speck of dirt or a muddy footprint. You must be a wizard! Haven’t been on your site in a bit but just had to comment on the beauty of “grand doggers”. I always enjoy your photos so much but this one is extraordinary even on my iPad. Keep the lovely pictures coming!.